35739, Private George Rewcastle, 1/6th Duke of Wellington’s West Riding Regiment was killed in action 1 November 1918. He was about 19 years old and is buried at Maing Communal Cemetery Extension, France and commemorated on the St. Helen’s Colliery Memorial Cottages, West Auckland War Memorial and the Roll of Honour, Memorial Hall, Darlington Road, West Auckland, County Durham. All were born at West Auckland. In 1911, the family lived at Ayres Yard. George (senior) worked as a coal miner (hewer). Later, the family lived at 35 New Street, West Auckland. 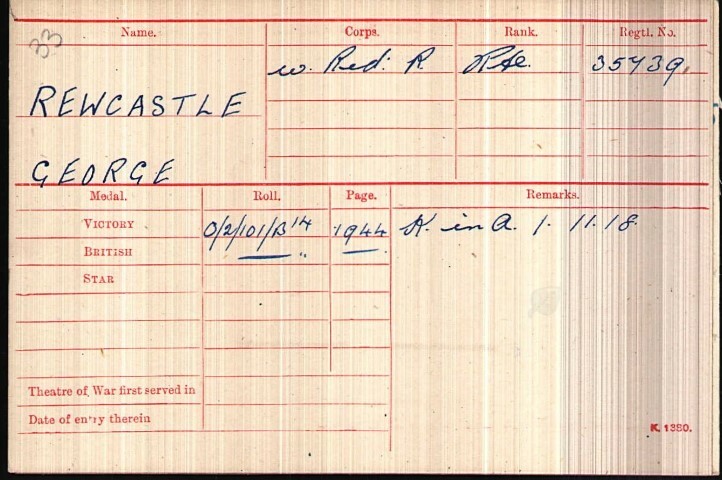 George attested 4 January 1917 and joined the Army Reserve. He was 18 years old. He was originally given the regimental number 95084. He undertook a medical examination 24 April 1918 when 19 years 3 months old, was 5ft 6¾” tall, weighed 116 lbs., had brown hair, fresh complexion and hazel eyes and found to be fit for duty. He was mobilized 24 April 1918 and posted to the 4th Battalion, the Durham Light Infantry. He entered France 4 September 1918 and was transferred to the 1/6th Battalion, the Duke of Wellington’s West Riding Regiment 7 September 1918 and given the regimental number 35739. He joined them in the field 8 September 1918. The 1/6th Battalion, the Duke of Wellington’s West Riding Regiment was a territorial force which was mobilized August 1914, landed in France 14 April 1915 and came under the orders of the 147th Brigade, 49th (West Riding) Division. The latter two battles are known as the Final Advance in Picardy. Private G. Rewcastle joined the 1/6th Bn., the West Riding Regiment in the field 8 September 1918 and will have seen action during the October offensives. He was killed in action 1 November 1918. The Battalion War Diary has not been researched. The following is an account of the 49th Division during October and November 1918. As a result of the troop shortages in early 1918, and the subsequent restructuring of the BEF, 49th Division lost three battalions; 146 Brigade lost 1/8 West Yorks, 147 Brigade lost 1/5 Duke of W and 148 Brigade lost 1/5 KOYLI. A comparison can be made between shells and casualties for these three battles in which 49th Division was involved. At Thiepval the attack had been supported by the firing of 10,700 shells, at Valenciennes by over 100,000. (Poelcapelle is not included in this comparison). Valenciennes 1,000 troops of which approximately 50% became casualties (though only 55 fatalities occurred in the two leading battalions). To conclude, did the learning curve of the BEF include 49th Division? Certainly, because lessons were learned, objectives were taken. But the casualties were still high. This is found to be the case in nearly all the attacking divisions during the 100 days. Research concludes that between 9 October and 4 November, the battalion lost 6 officers and 88 other ranks, killed in action and/or died of wounds and the Battle of Valenciennes, 1 – 4 November, the battalion lost 1 officer and 48 other ranks, 1 of which was Private G. Rewcastle. Private G. Rewcastle served a total of 1 year 302 days, the last 59 in France. He was awarded the British War and Victory Medals. 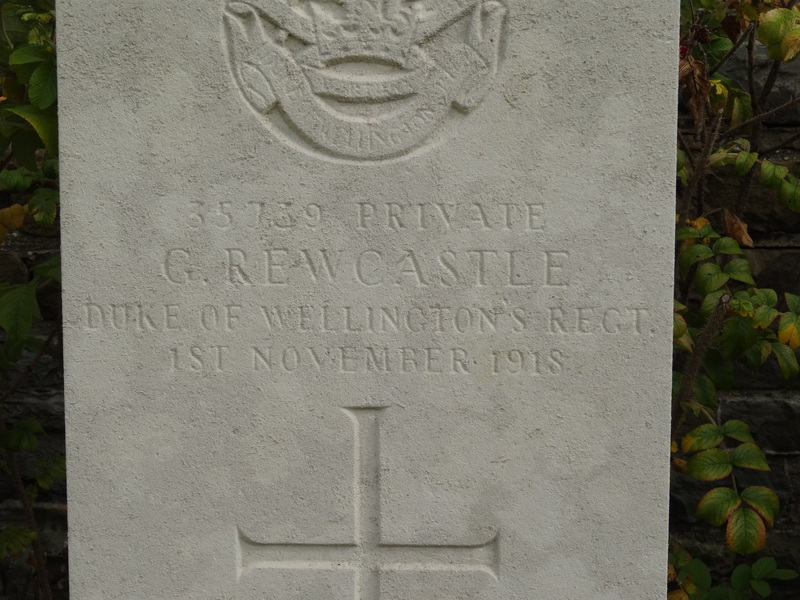 Private George Rewcastle is buried at grave reference C.17 Maing Communal Cemetery Extension, Nord, France. The cemetery contains 85 burials. The village of Maing was captured by the 51st (Highland) Division 24 October 1918 and the cemetery was commenced by the Highland Division and the 49th (West Riding) Division in October and November 1918.
 http://www.westernfrontassociation.com/great-war-on-land/britain-allies/1761-from-disaster-to-triumph-the-49th-west-riding-division-in-the-great-war.html Article contributed by: Peter J Palmer. This article is based on talk given by Derek Clayton to the Yorkshire Branch of the WFA. The talk was recorded, and can be found in the WFA Website’s Video Resources.